Micro-sprinklers spray water cooling moisturizer water irrigation set, helps you save your your time and water when watering plants and flowers. Widely used in automatic watering flowers and plants. Suitable for gardening watering, balcony patio cooling, greenhouse humidification cooling. The nozzle is designed with eddy current and built-in filter to prevent clogging. 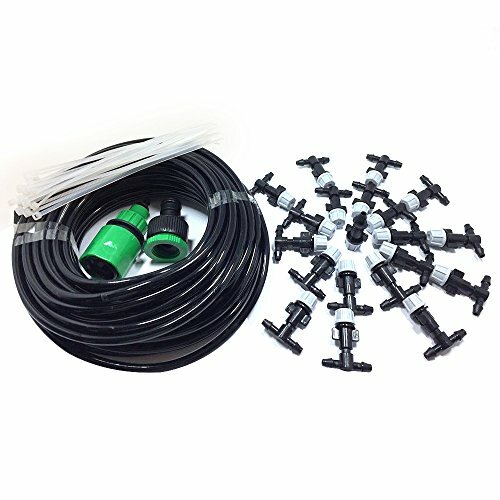 Mist Particles: 70 microns, Flow Rate: 6.7-7 L/Hour, Spray Diameter: 0.8m, Hose Length: 15m, Plastic Mist Nozzle Sprinkler: 20pcs. Come with removable nozzles kit for convenient change. Easy cleaning, easy to install and use. If you have any questions about this product by LeatherDIY, contact us by completing and submitting the form below. If you are looking for a specif part number, please include it with your message.